On Aug. 31, the New Brunswick Minister of Health announced the transfer of many of the public health functions of the Office of Chief Medical Officer of Health to other government departments. The government’s stated reasons are to streamline operations, increase efficiency, save taxpayer money and increase uniformity with other Atlantic provinces. This issue is now back in the news with a national group of doctors, affiliated with the Canadian Journal of Public Health, opposing this reorganization plan for New Brunswick. However, then-minister Victor Boudreau did not furnish examples or explanations as to how these goals would be accomplished. The new minister, Benoît Bourque, must do so, because common sense and experience suggest that this move will have exactly the opposite effects. As Mr. Boudreau said that there would be no lay-offs, there will be no savings in the salary costs or required working space that constitute most of the CMOH’s comparatively small budget. If, however, employees are physically moved to new departments, there will be moving expenses and productivity lost in the transition. It could also mean increased travel and communication expenses and wasted travel time in the future, if cooperative work across health disciplines is required. We see no cost savings or efficiency gains here. The departments receiving the transplanted health employees have no experience, and likely little knowledge, of public health issues. Thus, management will require training to master the details and learn to administer their new file. A related question is how will the existing priorities of the departments co-exist with their new public health responsibilities. Each department already has its own primary purpose. It is only natural to prioritize the known and familiar over the new and unknown. It is hard to envision any advantages in this reorganization, whether fiscal, in productivity, or in streamlined operations. What is easy to envision is the stripping of the CMOH’s authority, capacity and autonomy to provide the medical expertise necessary to protect the public’s health. Boudreau said that the CMOH will still be able to express independent opinions. Yet the scattering of public health expertise throughout the bureaucracy will make it more difficult for the CMOH to access the necessary personnel and resources for coordinated and comprehensive assessments of public health issues. It is hard to imagine that this new setup would be capable of producing anything comparable to the award-winning public health report on shale gas, produced by the former CMOH. The ministers of the PC government of that time supported policies that were directly contrary to many of the findings of the CMOH. Had the new public health policy been in place then, the ministers of those departments now housing public health employees would have had no incentive to allow their employees to work on a project that would be contrary to their political agendas. Actually, those departments had little knowledge of, and were often dismissive of, public health concerns despite evidence from the medical community. It was the CMOH’s report that elevated those health concerns to widespread public and political discourse. Historically, public health agencies were primarily concerned with infectious diseases, but the processes of modern life have increasingly threatened our health through air and water pollution, new and untested chemicals, and increasingly through challenges associated with climate change. The CMOH in New Brunswick had been becoming an interdisciplinary agency, equipped with expertise and experience in many areas. All of that will be lost in the breakup of the talent pool, producing the opposite of streamlining. 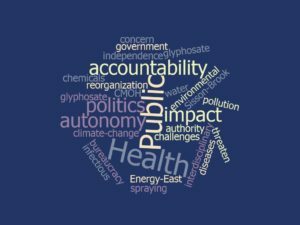 This reorganization follows the government’s still mysterious and expensive dismissal of the previous CM-OH, and occurs in the midst of current public health discussions concerning glyphosate spraying. It probably also forecloses the recommended implementation of public health impact statements to accompany the standard environmental impact statement in huge projects such as Energy East and Sisson Brook. It is hard not to take the cynical view that this new move is intended to handcuff the CMOH so that an independent, future CMOH cannot reach conclusions contrary to the economic or political agendas of the government. If so, it is a shortsighted, political decision that imperils the health of the citizenry. If not, then the government must provide details on the supposed benefits. Generic talking points won’t do. For example, aligning with other Atlantic provinces makes sense only if their systems are superior, and that case has not been made. If its explanations are not convincing, the government should jettison this move. What is needed is a truly independent, well-budgeted CMOH with its own place on the executive council.